Originally posted: May 29, 2017 . Last modified: January 28, 2019 . Summer is the perfect time for a barbecue chicken sandwich loaded with tender chicken and sweet barbecue sauce. The chicken is perfectly cooked and fork tender, so it’s easy to shred. Then, to complete this sandwich, the chicken is placed on a soft bun and topped with sweet, brown sugar barbecue sauce. Serve this barbecue chicken sandwich with a side of your favorite coleslaw for a complete meal. If you’ve been following us for a while, you might know that we live in an apartment. It just so happens that our apartment doesn’t allow grills. Whenever we want something barbecued or grilled, we have to go a different route. This time was no different. The chicken sandwich isn’t technically barbecued. 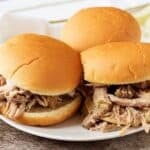 We used a slow cooker, and added a barbecue sauce to help get that outdoor, smoked flavor. This barbecue chicken sandwich combines juicy, tender chicken and hickory and brown sugar flavored barbecue sauce. It doesn’t get much better than this if you don’t have access to your own smoker. The chicken is cooked perfectly to soak up all that sweet sauce. When paired with your favorite coleslaw, it’s a meal you don’t want to miss. I chose the slow cooker method because it’s simple. Moreover, it doesn’t take a lot of monitoring to make this dish. You can drop the ingredients into a crock-pot, set the temperature, and then go on with your day. It takes a few hours to cook; however, I started mine when I first woke up, and it was ready in time for lunch. Since the meat is slowly cooked, it’s easy to shred. Just pop off the lid and use some tongs to rip the chicken apart. For our barbecue sauce, I chose Sweet Baby Ray’s Hickory and Brown Sugar Barbecue Sauce. The flavor is smoky and sweet. On the other hand, if you prefer a vinegar based sauce, feel free to substitute any type you like. Also, I forgot to add it myself, but a little liquid smoke would make this barbecue chicken even better! Don’t be afraid to experiment with flavors, that’s what makes cooking so great. How about we get started? To prepare this chicken sandwich, start by placing the chicken, seasonings, and broth into a two-quart slow cooker. Sprinkle the barbecue rub evenly over the breasts, then add the broth. Next, turn the cooker onto high heat and cover the pot. Then, let everything cook for about four to five hours. If you want dry chicken, you can strain it when it’s done or remove the lid for the last hour of cooking. The moisture may evaporate if the cover is removed. When the meat has cooked, use some tongs to shred it for the sandwich. Each sandwich gets approximately two ounces of chicken. Last, load the meat onto the bun and top it with barbecue sauce. Feel free to add any condiments you like and your favorite side dishes. That’s it; everything is done. In closing, I wish everyone a long life, love everlasting, and a full belly! We like to use chicken breasts for our sandwiches, but feel free to use chicken thighs if you prefer. For ease of shredding the chicken, try placing it in a stand mixer and use the paddle attachment. The chicken will shred in just a minute or two with minimal mess. If you don’t like brown sugar flavored barbecue sauce, choose your favorite! There are tons to pick from. If you like this barbecue chicken sandwich recipe, please leave us a comment and rate the recipe card. You can also find us on Facebook, Pinterest, Twitter and Instagram searching for Berly’s Kitchen! Looking for more chicken dishes? Give one of these a try! First, remove the chicken from the package and place it into the slow cooker. Next, add the barbecue rub. You can sprinkle it over the chicken without massaging it into the meat. Then, add the chicken broth, cover the ingredients, and let them cook on high heat for approximately four to five hours. After the chicken cooks, use a pair of tongs to shred the chicken while it sits in the crock-pot. Last, remove two ounces of chicken, per sandwich, and strain it before placing it on the bun. 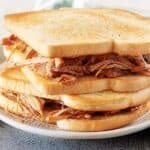 Top the sandwich with barbecue sauce. Serve it with sides and your favorite condiments. The calorie count listed is an approximate amount based upon the sandwich without the pickle and cole slaw. For dry chicken, strain it before putting it on the sandwich. Serve it with your favorite sides; like chips, cole slaw, or potato salad. I love a good slow cooker meal. This looks delicious! Mmmm. I love shredded chicken! Your photos are simply beautiful and the recipe is delightful and delicious! Can’t wait to try this dish! Drool City, population me. Seriously, this look SO delicious. I think I’d put that sauce on just about anything!